In a collaborative effort, researchers at Uppsala and Umeå University now show that the formation of methylmercury in sediment is controlled by the molecular composition of the organic matter. The study has been published in Nature Communications. The widespread occurrence of mercury (Hg) in the environment and, especially in fish has been highlighted because of the harmful effects of mercury compounds on the health of humans and other animals. It is mainly the methylated form of mercury (methyl mercury) that accumulates in aquatic food webs. Exposure to methyl mercury, occurring mainly through fish consumption, can affect the nervous, reproductive, and immune systems of vertebrates, including fish, birds, and humans. It is well known that certain bacteria and archaea have the capacity to transform inorganic mercury to methylmercury. The transformation takes place under the oxygen limited conditions typically found in wetlands and sediments, but we still do not know how mercury methylation is controlled and influenced by the prevailing environmental conditions. Now a new study from Uppsala and Umeå University demonstrates that the molecular composition of the sediment organic matter plays a central role for mercury methylation. “The study represents an important step towards a better understanding of the molecular-level processes controlling methyl mercury levels in boreal lakes at a global scale. The new information might also enable a more highly resolved and more robust mapping and modeling of mercury-related health hazards related to aquaculture and fisheries,” says Andrea Garcia Bravo, postdoctoral researcher at the Limnology program at Uppsala University and lead scientist for the study. The study is the result of a collaboration between the research groups of Stefan Bertilsson at Uppsala university and Erik Björn at Umeå university. 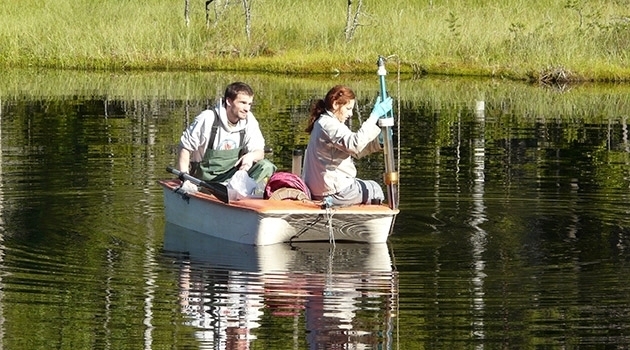 By tracking the transformation of isotope-labeled mercury compounds, the researchers could measure the mercury methylation rates in sediments from different Swedish lakes. Subsequently, the molecular composition of the sediment organic matter was determined with a new pyrolysis-mass spectrometry method developed by the co-author Julie Tolu. “It is well known that the organic matter is the principal source of energy for the organisms performing mercury methylation, but the strong coupling between specific organic compounds and mercury methylation rates surprised us,” says Erik Björn, associate professor at the Department of Chemistry at Umeå University. The results demonstrate that organic compounds originating from phytoplankton (e.g. from cyanobacterial blooms) are coupled to high mercury methylation. In contrast, carbon compounds from the watershed do not have this stimulating effect. “Instead, the presence of such organic compounds in the sediments are linked to import of large amounts of methyl mercury formed in the surrounding soils and wetlands,” explains Stefan Bertilsson, Professor at Uppsala University.